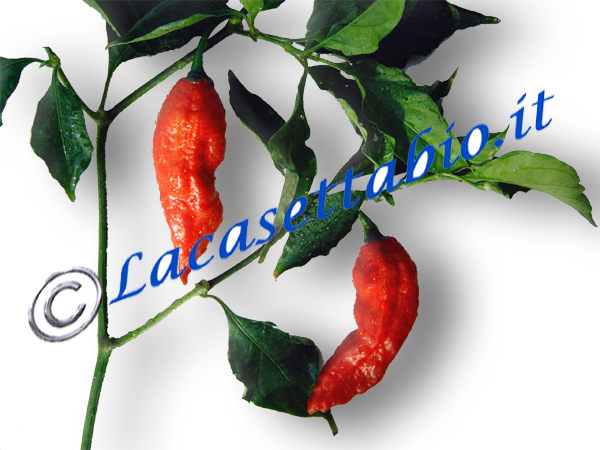 The hottest chilli pepper in the world ! The Bhut Jolokia chili pepper, belonging to the capsicum chinense family, has its origin from the region of Assam in northeast India, it is considered the hottest chilli in the world. It is on the book Guinness World Records 2009. This species has been discovered by a scientist (RKR Singh) who, working for a research lab in Tezpur in Assam region of India, decided to try this chili held in high regard by the Indians. Dispatched some samples to the Chile Pepper Institute (CPI) at the University' State of New Mexico. The results confirmed the extreme value of spiciness. 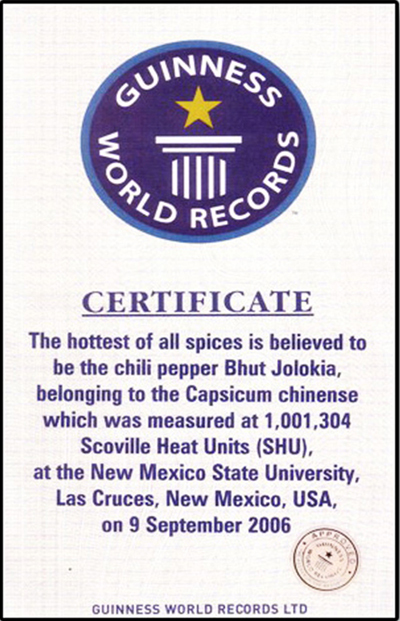 In 2001 Dr. Paul Bosland, also of the CPI, grew a few plants of the Bhut Jolokia in a desert climate at New Mexico. The analysis attributed to the Bhut Jolokia the world record of hotness, confirming the high degree of spiciness which reached 1,001,304 Scoville units. Anantha Saikia, owner of Indian Frontal Agritech, had analyzed samples of Bhut Jolokia grown in India, the level of spiciness reached 1,041,427 Scoville degrees. The Bhut Jolokia was nicknamed Pepper Ghost (Ghost Chillies), probably cause the plant produce fruit hardly and so it is hard to find it. Professor Bosland instead has his own opinion: I think it's called ghost because it is so hot that when you eat you out the soul! Outer surface is wrinkled and it has sweet, vanilla and inviting scented.